GungHo has been amazingly generous with the free daily Monster Points and many players are now able to make their very first purchase. However, Powercreep has shifted the landscape of what constitutes a formidable leader and you may actually be better off saving your Monster Points for new cards to be released if none of the current (or soon to be released) ones bring significant value to your box. This article will be mostly focused around the flowchart I have prepared. The content is based on recommendations that hold true today and things may change if new cards/awakenings/meta shifts occur. The following flowchart is designed to take into consideration all the current content released in JP. However, like tier lists, these recommendations should be taken with a grain of salt as your individual situation may dictate a different outcome. Clicking the following image will enlarge it and open a new tab. Despite the fact that Monster Points are becoming a more common commodity, they should still be treasured and your purchases should be worthwhile in adding value to your collection. It is my personal belief that Monster Point cards should help you progress through content and they generally do so through their leadership capabilities. However, if you already possess competent end-game teams, the actual need to purchase one of these cards is greatly diminished if they do not actually help you advance into harder content. One can argue that some Monster Point cards can make your life easier, but that can be harder to quantify as opposed to something that can push you more into end game content. For example, if you are struggling to clear Arena 1 and you own the majority of strong component for a Dark Athena team, purchasing her can be a huge boon to your box as you would have in theory the capacity to clear Arena 3. Once again, this is my belief on how to best use Monster Points: purchasing a leader who can carry you further into end game content. 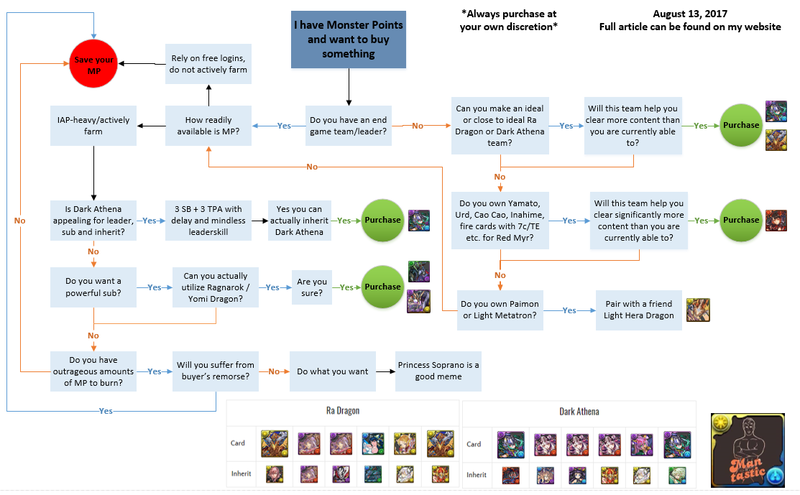 The main goal of the flowchart is to first establish whether or not you have an end-game leader/team and whether or not a Monster Point card can help propel you forward. Picking up a powerful leader who has synergy with your Monster Box should be your first priority. This is because if you are able to unlock more clearable content, you will begin to amass more resources such as Py, Best Friends, and rank experience. While some may argue that Dark Athena and Ra Dragon are tapering off in 3P Cosmic Trinity, they are still able to trivialize Arena 3 which may still be out of reach for the average player. If none of these are viable, you then proceed to determine if you can field a Red Myr team that is actually capable/strong. You do not actually need to purchase Light Hera Dragon as you can simply pair with your Light Metatron or future split evolution Paimon. If you already own an end game team that is capable of clearing the same level of content as the above cards, it now becomes more of a want rather than need factor. By this I mean that you do not technically need a Monster Point card to advance your level of progression and instead want more toys in your collection to potentially make your life easier. However, the first step is to determine if you are able to amass Monster Points easily and whether or not you simply rely on login bonuses or actively farm them from Rogue Descends/Arena. If you do not have the time/motivation to farm MP, it would be best to simply save for the next big wave of Powercreep. However, if you have the ability/financial resources to amass Monster Points, you can then investigate ways to make your life easier. Dark Athena is still a wonderful leader who has tremendous flexibility as she can function as a wonderful sub and surprisingly powerful inherit. While 750,000 MP is edging on luxury, it can be affordable to a dedicated player and she may make your life easier moving forward. If Dark Athena is not desirable, it comes down to whether or not you can efficiently use Ragnarok Dragon or Yomi Dragon . If neither work for you, the logical decision is to simply save your MP unless you really want to buy something. At this point you can follow your heart as none of the remaining options are currently meta/powerful at the time of this posting. Veteran players or those who are able to comfortably clear the majority of current content will find little value from purchasing a Monster Point card as they will not help advance their level of progression and may edge more on luxury than necessity. However, newer players or those lacking a potent end game team may find merit in purchasing the stronger leader options available, especially if they can field a nearly ideal team. Let me know what you plan to do with your Monster Points and whether or not the above flowchart holds true for you. I’m a little torn… I wish I knew if the Four Gentlemen were getting evos anytime soon, as I’m mildly interested in buying Xiu Min, but the big price tag on RMyr and LHeraDra forces me to hold off on any purchases for now. While I could make an RMyr team, I don’t know that she adds capability to my box and her playstyle seems kind of stressful. LHeraDra on the other hand fills a hole in my box, as I don’t have any of the high tier light leads (Yog, Ameno) so I have to pair with other leads like Tifa(/Ameno) or Hiko(/Yog). I also love 5oe gameplay. They also keep increasing the value of my dupe GFEs by adding split ults and Uvos, so I can’t liquidate them for points! My Fenrirs may actually be useful! As for Light Hera Dragon, do you have Light Metatron or Paimon oO Just use yours and pair with a friend! I do have LMeta, no Paimon though. I’ll do some R&D on LHeraDra, see what works best… plenty of time to figure it out. I am waiting for the next wave. Sitting on 725k on main and about 400k on alt. Both accounts have dathena already. I already have Dark Athena and will probably get RMyr when she comes out because my fire box is stacked. Other than that, i have no need for the mass amount of MP that I have stored up. I bought BMyr when she first came out and got a ton of mileage out of her, no regrets. But she doesn’t do anything different from regular Myr, except support a blue TPA team if you have the right subs, vs LMyr being traditionally more row oriented. Even that difference is slight these days… I got a lot of mileage out of Scheat on BMyr, I think you can use LKanna on LMyr. I’m a huge blue fan, and blue is the strongest part of my box, so she was a no brainer for me. But she’s really a luxury purchase that most players won’t get a ton of value out of these days, as BMyr and LMyr are pretty far out of the meta. They definitely allow for farming A1 (and probably A2) though if you don’t have a team for that. Beyond that though, the consistency starts dropping quickly. Light Myr > Blue Myr overall and while BMyr had merits upon her release, it is hard to justify her now. I’ve amassed nearly 1.2 million MP and seem very tempted to buy triple Ragnarok Dragon, but the potential offered by Uuevo’s to the Four Gentleman has me restrained. In particular, Xin Hua to be used with the new Gremory uevo’s. I would argue that downplaying the purchase of LHera to only pair with a Lmeta or Paimon is a bit of a mistake. Recently it seems that the game is becoming more focused on combo shields or resolves, as well as damage negation. Having to match with a cross lead like Lmeta or Paimon makes it much harder to utilize any solutions to those 3 annoying mechanics. Also matching with Lmeta restricts the subs you are able to use to only Gods, thus missing out on Paimon as a sub. 136k HP, 5k or so RCV, bind clear, heal active, a 75% shield and 4 heartmakers. Team will have a follow up attack sub, a ton of TE to make combos, 2 subs with 2 TPA but no currently available solution for damage negation. I’d like to disagree with you. LMeta suffers from low health, but she has a very high amount of recovery. She also suffers from (somewhat) low damage if you don’t double cross light orbs, which makes her very orb hungry and board-space hungry. Meanwhile, LHera has a boatload of health, which means she can almost reach a level of health that most tank teams have just by him/herself (do dragons have genders?). LHera suffers from no recovery multiplier, which is covered by LMeta, which, once again, is so amazing that she can carry her team to normal standards. He/she also has no SBR, but this problem goes away when you pair with LMeta, who does have SBR. That’s already a few advantages there. …compared to LMeta’s 6.25x, 56.25x, 506.25 and LHera’s 4x and 100x. So yeah, LHera has little damage control anyway. Now, about combo shields and comboing in general, you only need to make one light cross because 75x is respectable. And it’s definitely possible to 7c, as shown by Fire Myr. As for not being able to use Paimon… okay you got me there. I guess I’m just lucky to roll LEschamali on my first try not including free roll, which I rolled Akechi. I was thinking of using my Escha and then using typical light subs such as DQXQ and Wukong, which are all gods. But if you have a good option that brings two more light OEs, the typing limitation shouldn’t be an issue. I’m spending all of my MP on water jewel dragons. Because while I have like 8 of every other color, I have 0 of blue. I like most of the flow chart except the part about yomidra and ragnarok. Yomidra is one of the fastest a1 farmers thanks to the mindless playstyle and ability to utilize dragon killer tsubaki to deal with dkali more effectively. If what you want is a lot of piis in a short time yomidra is the way to go. Ragnarok’s new ult puts his multiplier roughly on par with radra except ragnarok can run dupes of himself and achieve better damage output through use of killers and requires less rem luck. The only draw back is 3 ragnaroks being a heavy investment. Where does Xiu Min fall as she’s a top tier-ish sub for Amenominakanushi teams especially for A3? While there are better options to get to the HP thresholds they are all either super-exclusive collab rolls or 6-star GFEs. Pretty sure Xiu Min is a he 🙂 I’ve actually found a few places where Xiu Min is useful, but generally it’s still a pretty niche card. I have Tifa, who pairs pretty well with Xiu Min as a lead, but I don’t know if I’d use him as sub. As always, if a card grants you the ability to do something you couldn’t do any other way, or was the key to easily farming A3 or something like that, you can answer the question for yourself. For most players Xiu Min isn’t worth dropping 300k on right now. Best to wait for a Uvo announcement before pulling the trigger, especially with new 750k options on the horizon. I personally can’t wait for Red Myr, i’m sitting on a rather large bit of monster points right now.